Wolf Faust is manufacturing reflective and transmissive scanner calibration targets according to the IT 8.7/1, IT 8.7/2 and ISO 12641 standard. You can use these targets with various scanner profiling software to color calibrate your input device. The price is very affordable (roughly 75% less than what you pay for a Kodak, Agfa or Fuji target). The targets can be used with IT 8.7 or ISO 12641 compatible software. Here are the details and prices on the stocked targets. For custom made targets not listed please contact Wolf Faust. IT 8.7/1 Type 3 (35mm) For older Fujichrome Astia/Sensia/RTP II and Provia films incl. Provia 100F. Exception: Use N3 for new Astia 100F, Provia 400X, Sensia 100 films prod. since June 2003. IT 8.7/1 Type 1 (4x5in layout) For Fujichrome Astia/Sensia/RTP II and Provia films incl. Provia 100F. Exception: Use N1 for Astia 100F, Provia 400X and Sensia 100 prod. since June 2003. Individually Measured! large format slide film scanner or flatbed scanner with transp. unit. IT 8.7/1 Type 1 (4x5in layout) For Kodak Ektachrome film - Individually Measured! IT 8.7/1 Type 1 (4x5in) For Agfa RSX (II)/CT Precisa films - Individually Measured! IT 8.7/1 Type 3 (35mm) For Astia 100F, Velvia 100/100F, Provia 400X and Sensia100 films prod. since June 2003. IT 8.7/1 Type 1 (4x5in layout) For Astia 100F, Velvia 100/100F, Provia 400X and Sensia100 films prod. since June 2003. Individually Measured! 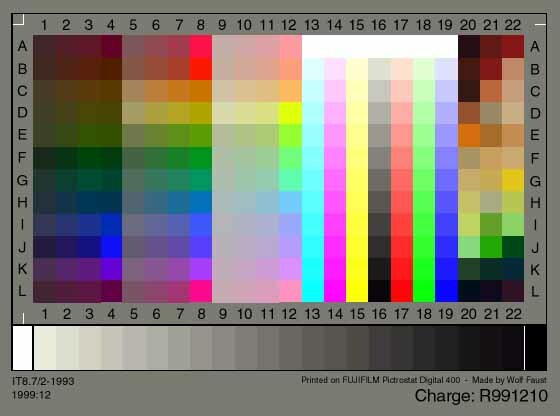 A note for Sensia 100 users: FujiFilm changed the color giving dyes inside the film in 2003. Films produced since June 2003 (emulsion 687 and higher) require the N1 or N3 target. Sensia 100 films produced until May 2003 (emulsion 650 and lower) require the F1 or F3 target. All prices are excluding shipping (see below). All Euro prices listed include 19% German sales tax when shipped inside the European Union (EU). Payment inside the EU must be in Euro. Non-EU customers may also pay US$ prices as listed. If you have further questions about the target prices please contact me. Discounts are available if several(!) targets of the same type are ordered without CD and plastic box. For instance, if you order 10 R1 targets from the US without CD/box you do get a total of $10 discount. Please ask. IT 8.7 compatible reference file containing the color measurements for the target. All items ship with the reference files on a CD wich can be used with PC, Mac and other systems. "Nachnahme" (COD / Germany only) does cost an additional Euro 5 (incl. "Zustellgebühr"). PayPal: You may pay with credit card using PayPal. For ordering sign-on to your PayPal account and send the money to wfaust@wfaust.de . Just note the wanted targets and other wishes/details in the payment as comment. I do regularly check my account and you will receive a confirmation of your order by email (usualy your order is processed within one business day). All prices listed already include the PayPal transaction fees - so there is no extra charge. In rare cases PayPal shows that I do not accept the payment. This is wrong. Please contact me wfaust@coloraid.de and I will send you a PayPal money request for the wanted item. Wolf-Juergen Horacio FAUST, Germany. Once you arranged the payment simply let me know your payment details by email /fax: transaction id, name+address, password (if necessary) and of course the wanted items. While payment using Western Union is rather fast and safe, there is a fee involved you have to pay. So I would not recommend it for just one R1 target unless you need your target quickly and PayPal is no option to you. Cash in a letter: especialy for small orders this is still one of the cheapest methods. Inside the EU you might consider registering/insuring the letter (from the several thousand letters shipped during the past 10 years only 3 got lost... so consider yourself if an insurance is worth the money). My address is listed below..
Bank transfer: bank transfers are only accepted from government institutes or large (dealer/manufacturer) orders. Please ask. I do not accept bank transfers from private persons with small orders. My main intention is to make the targets available as cheap as possible without extra work or risks on my side. Bank transfers do require more work with accounting and there has been a lot of problems with underpayed invoices because of high bank fees in the past. COD/Nachnahme: Users inside Germany may pay using COD (Nachnahme). An extra COD/Nachnahme shipping fee of 5 Euro (incl. "Post Zustellgebühr") applies. Simply send your order by letter, email or fax and note the COD payment method. Postal Money orders: Customers inside Europe not willing to send cash may also send money using postal money orders from their local post office. Do send an extra note using a letter or an email with your order details and shipping address as sometimes postal money orders are hard to read or incomplete. An important warning: it seems in some countries (UK?) postal money orders are sold as "check" that must be shipped to me in a letter. These are basicly checks that can not be cashed here localy, despite what the seller may say. Postal money orders are nowdays transfered electronicly to my local post office and it does not involve you to send me anything. If your post office tries to sell you some check like paper you have to send, do not accept it. Postal money orders usualy need 7 days to arrive. So it's a safe but rather slow method. You want to order a single reflective target R1 for your flatbed scanner. As payment method you choose to send cash and send Euro 10 for the target order number "R1" plus Euro 5 for shipping inside the EU. If you are outside the EU, the same target would cost Euro 10/US$ 10 plus Euro 10/US$ 10 worldwide shipping. Ordering one S2 target set plus worldwide shipping is just Euro 70+10 or US$80+$10. Using PayPal as payment method is surely the fastest and one of the safest methods. For those who want something special: Wolf Faust does offer his targets at basicly any size (up to 2 meter height!). So basicly large enough for any task you like. Note that these oversized targets are only made beside the normal production. Contact Wolf Faust for details and if such a large target really does what you want (photo paper color spectrum!). Also custom targets specific for your needs can be made. Also available are targets with your company "logo". Note that just because the targets are sold so increadible cheap doesn't mean they are of low quality. The opposite is true. Target prices are low because there are major customers ordering large volumes. Only because of those large orders I can afford the development/production devices necessary to produce high quality targets. Also you do buy from the manufacturer and pay cash in order to keep shipping/handling fees low. There are no distributor and dealer fees involved, yet I hope there will be more dealers selling my targets for those who want the normal mail order service for a "normal" price. Only small target charges are produced making sure the important reproduction fault of the targets is very low (see the reference files below for statistical data and error details on an actual production). Major efforts were spend making sure the film targets produced do have a very large color gamut. Important calibration patches like neutral dmin/dmax (A16/L16) and dmin/dmax (GS0/GS 23) are reaching the limits of normal E6 film processing. This makes sure no highlight/shadow details are lost with scanner profiling software. The 35mm type 3 targets have a similar large gamut as the large 4x5" type 1 targets. While the IT 8.7/1 or ISO 12641 standard does not define error tolerance limits for the 35mm type 3 targets, the targets are well within the error limits specified for type 1 or 2 targets. Download the latest reference files below for the latest info on reproduction fault, deviation from the color values defined by the IT 8 standard. For nearly all targets there are some sort of "extras" available: reference files for white backing, spectral data in various formats (CxF, CGATS, Excel, EPS), data for different illuminants or observers and more. Compare the values with other target manufacturers and you will quickly see there is no other manufacturer getting close to the quality of coloraid.de targets.